When Janome, designer of such innovative sewing machines as the Memory Craft 1200, set out to engineer enough feet and accessories to cover just about every sewing need possible, they knew there would also need to be a reference tool to explain it all. Grand Rapids sewing fans rejoice: Online Sewing has recently released a reference book detailing 43 different feet and accessories for its top-loading machines (now available at Gall Sewing and Vac Centers four locations in Grand Rapids, MI - Lansing, MI - Muskegon, MI - and Wyoming, MI). Grand Rapids-based Gall Sewing and Vacuum Centers is a long-time provider of Janome machines, including the Horizon Memory Craft 12000 and the Janome MB-4. So the company is eagerly selling the interactive reference (both through its website and at each of its four area centers) because, beyond simply selling products, the iconic store has always sought to teach and support its customers as well. Janome sewing machines are wonderful for merging the latest technology with sewers, and are perfect for all sewers from beginner to advanced. The amazing Footbook allows you to use your Janome to its full potential, teaching you not only the common use for each foot, but also explains several alternative uses that can expand your creativity. The FootBook includes photos, videos and text for each of the 43 Janome feet and accessories. Allowing you to see the feet in action and read text explanations of how to use each one. Version 2.0 now includes all the feet for the Janome Horizon Memory Craft 12000! FootBook 2.0 is available for order for just $24.95 on Gall's website: http://www.gallsewingvac.com/Footbook.aspx. Janome owners with an iPhone, iPod Touch, or iPad can also now download the e-book from Apple's App Store for just $6.99. An option to purchase the program on a DVD is also available. (Note: The FootBook is not compatible with Janome machines with an oscillating hook -- drop-in bobbin machines only. However, this reference tool is compatible with some machines made by Janome bearing a different name, such as Kenmore, New Home, and Elna if they use a drop-in bobbin). 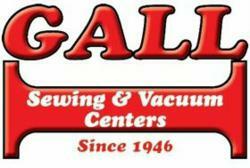 To learn more about Gall Sewing and Vacuum, give the company a call at (888)-363-1911, visit their website (gallsewingvac.com), or head over to any one of the four area locations. Come Sew with Us! Gall Sewing and Vacuum Centers is determined to be a reliable one-stop shop for Grand Rapids residents looking for unparalleled quality and service for vacuum and sewing machine needs. The company has been selling top-quality sewing machines, vacuum cleaners, quilters, heaters and sewing cabinets to the community for more than 60 years. Their pristine sewing machine line includes machines from Janome sewing machines, Brother sewing machines, and Elna sewing machines.